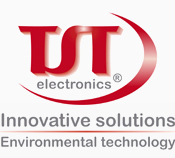 The TST Monitor plus is a software solution, which is used for central and decentral monitoring of vapour recovery at filling stations. The software will be installed on the POS or Shop PC. After starting the PC the software starts automatically and runs in the background. It continuously monitors, records and indicates the status of the vapour recovery at the individual dispenser via WLAN. Messages can be forwarded per e-mail, fax or SMS. The TST Monitor plus enables you to log** into the individual dispenser in order to monitor the measured values and edit the messages in real time. It supports various modes of communications including DSL, UMTS and GPRS.